From the bright lights of Times Square to Brooklyn’s chic boutiques, New York City is home to many vibrant and eclectic neighborhoods. To explore them and their unique vibes, you can try hop-on hop-off tours, thematic walks, river cruises, or even going at it solo. No matter your method, this guide will help you discover NYC’s top districts. Historically home to punk rockers and artists, the East Village is gentrifying quickly but still maintains an edge. Highlights include the Japanese restaurants on St. Mark’s Place, McSorley’s Old Ale House, and leafy Tompkins Square Park. Vintage shops, boutiques, and cocktails bars abound, so explore the area on foot, day or night. Right in the middle of Manhattan, aptly named Midtown is home to some of New York’s top attractions, including the Empire State Building, Rockefeller Center, Grand Central Terminal, and the Museum of Modern Art. The Theater District, in Midtown West, is packed with—you guessed it—theaters large and small as well as television studios. For discount show tickets, stop by the famous TKTS booth, then walk up Broadway to see the lights of Times Square. The Upper East Side, adjacent to Central Park, is perhaps best known for its numerous, world-renowned art museums. This Fifth Avenue stretch, known as Museum Mile, includes the Metropolitan Museum of Art, the Guggenheim, the Neue Galerie, and El Museo del Barrio—the only New York museum dedicated to showcasing Latino artwork. This vibrant, historically African-American neighborhood has transformed in recent years, but stays true to its Harlem Renaissance heritage. Numerous bars and restaurants offer stellar menus and live music, including the iconic Apollo Theater. 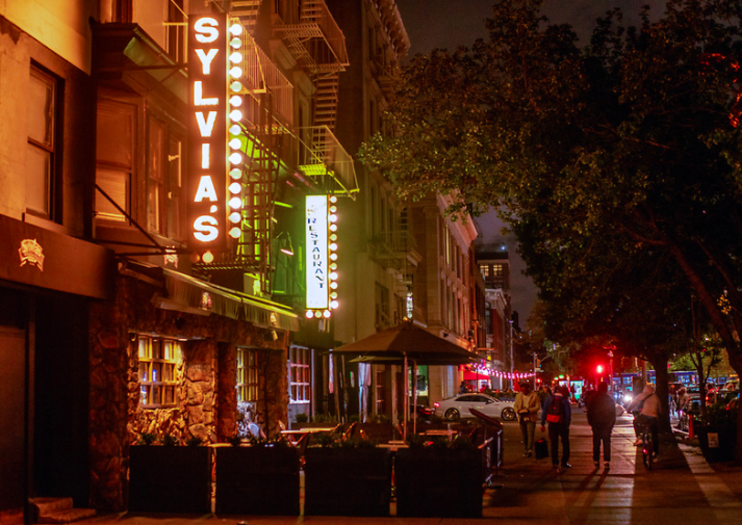 For New York’s favorite soul food, stop by Sylvia’s, and visit the celebrated Studio Museum to experience Harlem’s art scene. Chinatown and Little Italy are a living testament to New York City’s immigrant past. Strolling down Mulberry Street, Little Italy’s main drag, you’ll find classic red-sauce Italian restaurants, pizzerias, and gelato vendors. Crossing Canal Street into Chinatown, you’ll uncover narrow, bustling streets brimming with ethnic shops, food vendors, and small markets. For the best dim sum in the city, pop into one of the restaurants on winding Doyers Street. This waterfront Brooklyn neighborhood is the epitome of cool. Williamsburg’s epicenter, Bedford Avenue, really comes to life on the weekends. Here and around the ’hood, you’ll find hipster clothing boutiques, trendy restaurants, and music venues. On Williamsburg’s north side, Brooklyn Brewery offers locally brewed craft beer, and McCarren Park is a great place to relax. Make the most of your time in the city that never sleeps with a guided tour of NYC’s top attractions. Travel by both boat (April–December) and bus as you swing by Wall Street, the 9/11 Memorial, South Street Seaport, Federal Hall and much more. You’ll then hop aboard a luxury boat for a sightseeing cruise past the Statue of Liberty and Ellis Island, complete with stunning views of the New York City skyline and Brooklyn Bridge. Finish your day exploring Central Park and landmarks like Lincoln Center. See the Big Apple with a Big Bus hop-on hop-off tour Classic ticket. Pass top attractions like Central Park, the Empire State Building and more, and learn about the history of the city from an on-board guide. Then, when you're ready to explore a part of town in greater depth, hop off. Upgrade to a Premium ticket that includes the choice of the Brooklyn Loop, the Harlem Loop or the Panoramic Night Tour. Choose the Deluxe ticket to include all loops and a sightseeing cruise. Discover New York City’s gospel heritage on this spirited tour of Harlem, complete with a Sunday morning gospel choir service. See musical landmarks like the Apollo Theater and Cotton Club on a coach tour, and explore parts of this vibrant neighborhood on foot. Visit a local congregation to take part in a traditional Sunday gospel service featuring the soulful stylings of the choir. Upgrade to include a hearty soul food brunch at a favorite local restaurant. A hop-on hop-off New York bus tour allows you to see the city at your own pace and provides easy transportation to top sights. Entertaining tour guides keep you informed when you’re on board, and you can hop off and on the distinctive double-decker tour buses when you wish to check out attractions like the Empire State Building and Rockefeller Center. There are several options and combos to choose from with access to the Uptown Loop, Downtown Loop, Brooklyn Loop and Night Tour, or upgrade to add attractions to your tour! From stroopwafel to mozzarella to knishes, there are many amazing eats on Manhattan’s Lower East Side. This small-group 3-hour guided Lower East Side walking tour takes your taste buds to the most edible parts of the historic neighborhood. Emphasizing immigration and its influence on the area, the tour focuses history—and the food—of one of the city’s most dynamic areas. The small group means you’ll get easier access to the guide. Hip-hop music began in New York City. There's no better way to explore the genre of music than by taking this entertaining and informative tour with one of rap's Grandmasters. The unique experience offers an interactive tour through Manhattan, Harlem and the Bronx, showing the origins and evolution of hip-hop and rap music. Explore two of Manhattan’s most unique destinations while tantalizing your taste buds on this 3.5-hour combo tour of High Line Park and Greenwich Village. Stroll along the leafy expanse of New York’s newest public park, built on an elevated former railway line along the city’s West Side. After working up an appetite, follow your senses on a tasting tour through trendy Greenwich Village. Learn about the neighborhood’s bohemian history and high-profile residents while stopping to sample authentic Big Apple eats like pizza, chocolate and Italian specialties. Experience Harlem’s authentic sounds and flavors on a 4-hour, guided walking tour with a gospel service and brunch. Follow your experienced guide through the heart of the Mount Morris Historic District, where well-preserved brownstone homes evoke New York City’s gilded age. See the storied historic theater, then attend a local gospel service to clap, stomp and sing along to classic Harlem melodies. Finish your tour with brunch at a local restaurant, and enjoy a leisurely Sunday morning in one of Manhattan’s most vivid neighborhoods. Tuck into the flavors and traditions of two of New York's top neighborhoods for taste on this Chinatown and Little Italy food tour. Your friendly guide will lead your small group though narrow streets and share stories about history and culinary cuisine. You'll sample homemade mozzarella, enjoy a sit-down dim sum experience and end the day with a list of recommendations for further exploring. This is the perfect way for locals to get off the beaten path and an even better chance for first-time visitors to see what all the excitement is about while getting the lay of the land. Taste your way through Harlem's eclectic food scene on a 4-hour walking tour. Sample traditional soul food, African cuisine and Caribbean bites as you explore the neighborhood on foot with a local guide. Listen as your guide fills you in on the rich history, culture and traditions of the vibrant neighborhood. Be sure to bring your appetite, you won't leave hungry; you'll walk away with a list of restaurants you can return to in the future. Discover the three genres of music that helped form rock culture in New York City’s East Village on this guided, 2-hour rock walk. Rock, punk and glam helped introduce new music, rock ’n’ roll fashion and a way of life to the world. See where bands like the Ramones, the New York Dolls, the Velvet Underground, Led Zeppelin, Iggy Pop and others wrote music and played gigs. Soak up the rich musical history and get to know the East Village rock scene on the Original Rock ’n’ Roll Walking Tour. Explore the rich history of some of New York City’s most interesting neighborhoods — SoHo, Little Italy and Chinatown — on this guided walking tour. In SoHo, visit the Cast Iron Historic District and learn about 19th-century architecture. In Little Italy, see mob sites and hear about John Gotti, an American mobster who became boss of the Gambino crime family in New York City. In Chinatown, soak up the sights, smells and sounds of the neighborhood. New York City has many sides. So many that most visitors and even some locals don’t seem them all. This guided tour takes you to some hidden enclaves in the Big Apple: visiting Brooklyn the Bronx and Queens, stopping in ethnic neighborhoods to learn about the culture, eating the food and seeing landmarks from famous films. New York City is a drinking town. And this bibulous tour takes you to one of three bustling booze-flowing parts of town, visiting some of the best bars and pubs in the Big Apple. Hit the true local spots, eschewing the tourist traps and the bridge-and-tunnel bars. From historic saloons to celebrity hangouts to classic New York dive bars, this tour will show you the real Big Apple drinking scene! Take an evening walking tour with an in-the-know guide through the heart of Manhattan’s booming cocktail scene. New York is a true cocktail town, both for classic and cutting-edge libations, and the East Village, where this tour takes place, is one of the best places to drink in the Big Apple. Enjoy three beverages and explore the dynamic neighborhood, learning about where the best restaurants and bars are in the area. This small group tour is limited to a dozen people, which means more attention from the guide. There’s more to Times Square than meets the eye. And there’s a lot to see. Explore one of the busiest neighborhoods in the world on this guided, 3-hour sightseeing tour. Start at one of the nation’s most historical landmarks, the iconic Grand Central Terminal. Grab a bite to eat and discover the grand façade, main concourse — even a hidden passage to the street. Then marvel at the Midtown skyscrapers and bright lights of Broadway. Food samples along the way are included. Explore the rich history of some of New York City’s most interesting neighborhoods — SoHo, Little Italy and Chinatown — on this guided, 2-hour walking tour. In SoHo, visit the historic Cast Iron District and learn about 19th-century architecture. In Little Italy, see mob sites and hear about John Gotti, an American mobster who became boss of the Gambino crime family in New York City. In Chinatown, soak up the sights, smells and sounds of this neighborhood, home to the largest portion of Chinese people in the Western Hemisphere. Experience Midtown Manhattan through its unusual network of covered passageways on this guided walking tour. Explore the extensive labyrinth of tunnels that connect private and public places between Hell’s Kitchen and Tiffany & Co. with a savvy guide. Get a primer on New York City history, see striking works of art and architecture, and learn how insiders get where they’re going—while staying dry—on a rainy day. Midtown Manhattan is home to a heavy concentration of iconic New York landmarks, and on this accessible, small-group walking tour, you can look forward to discovering most of them in the span of just a few hours. Meet your guide at a convenient location, and set off on a stroll that makes many indoor stops, a great option any time of the year. You’ll encounter the Empire State Building, Chrysler Building, plus other art deco wonders, and will walk down Fifth Avenue, venture into Bryant Park, and explore Grand Central Terminal. As you go, you’ll also learn the stories behind the sights. Discover the many delights of New York City's Central Park on a leisurely Sunday morning walking tour. Stroll along the pathways, gardens, ponds and monuments of Manhattan’s beloved ‘front and back yard’ with a local guide, who will show you the most charming pockets of the sprawling park and share its fascinating history. Also explore the stately buildings and luxurious avenues of the Upper East Side for a classic New York morning. Create a one-of-a-kind ring with a 3-hour jewelry class in the East Village, and work with the tips and guidance of an experienced jeweler. Start from scratch or bring a favorite idea to life in silver or brass, with the option to upgrade to 14- or 18-carat gold. Enjoy the personal, hand-on experience of a small-group workshop with just four students per class. Engrave your creation with your initials, and take home an unforgettable, unique memento.